Colour Design Seminar – Strategies to improve Environmental Visual Literacy in Aged Care Facilities. This colour design seminar focussed on environmental visual literacy and colour/contrast strategies that can improve the interface between environmental design and users. Environmental visual literacy relates to the way in which users ‘read’ visual cues embedded in the built environment and make sense of these in a meaningful way. These visual cues include design details that may support or hinder engagement, orientation, wayfinding and the safe performance of daily activities. Specific colour and colour/contrast strategies can improve environmental visual literacy. As passive design features, these can have a positive impact on engagement, orientation, wayfinding and the safe performance of daily activities. 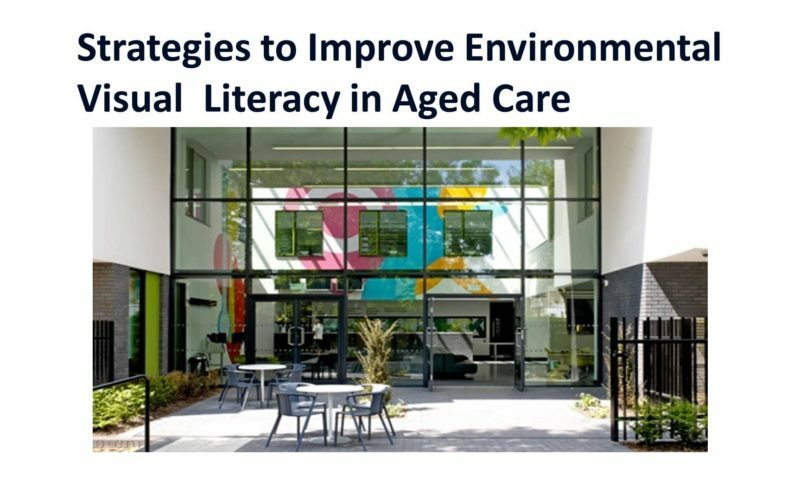 Effective environmental visual literacy is particularly important in aged care residential facilities where residents often experience reduced visual as well as cognitive capacity. This seminar referred to an Environmental Visual Literacy audit and checklist. This checklist provides a way to identify strengths and weaknesses in the built environment. Outcomes from this audit can be used to inform modifications to the built environment and introduce colour/contrast strategies to improve environmental visual literacy in aged care. This seminar was presented to interior design students at Sydney Design School.